Any long time comic reader can attest to becoming jaded with the medium at one point or another. Over the last several years, new work seems more akin to pitches for Hollywood rather than exploring the medium. 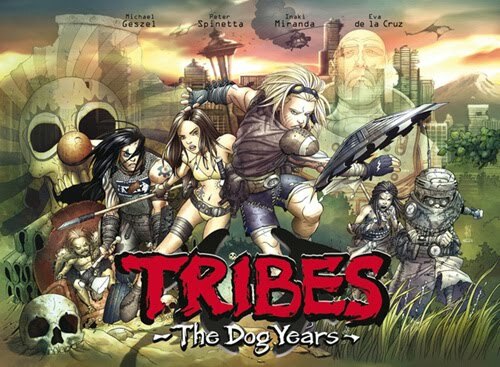 Tribes – The Dog Years- is not only gorgeous, but creatively pushes the boundaries of the printed page. The term “widescreen comics” gets thrown around a lot. Mostly because the level of violence and Bruckheimer levels of destruction. Tribes is truly a widescreen book for another reason. 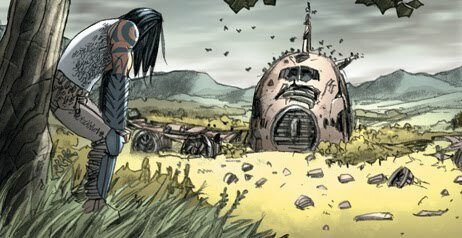 Published in a horizontal landscape format, the graphic novel (and this is a graphic novel, not just a random collection of issues), combines elements of Logan’s Run, Avatar, The Road Warrior, and Akira into a completely fresh, engrossing story that deserves a spot on everyone’s reading list. Michael Geszel and Peter Spinetta’s script is set a century after an apocalypse which shortened the lifespan to 21 years. Humanity lives in tribes within the brush amidst the junkyard ruins of the past; is there hope? Can humanity’s damaged lifespan be restored? The real selling point of the book is the stunning art by Inaki Miranda. Character design, environments and storytelling are amazing and Miranda’s work reminds me of Frank Quitely meets Katsuhiro Otomo meets Taiyo Matsumoto. I would be making a grave error by ignoring the breathtaking coloring by Eva de la Cruz, who does some of the finest work in comics that I’ve ever seen. Although Tribes might not be the most groundbreaking tale ever to be published, the artwork is so magnificent that this is a book you will go back to again and again. It is a definite recommendation and if you still don’t believe me, click HERE and read the first thirty pages!